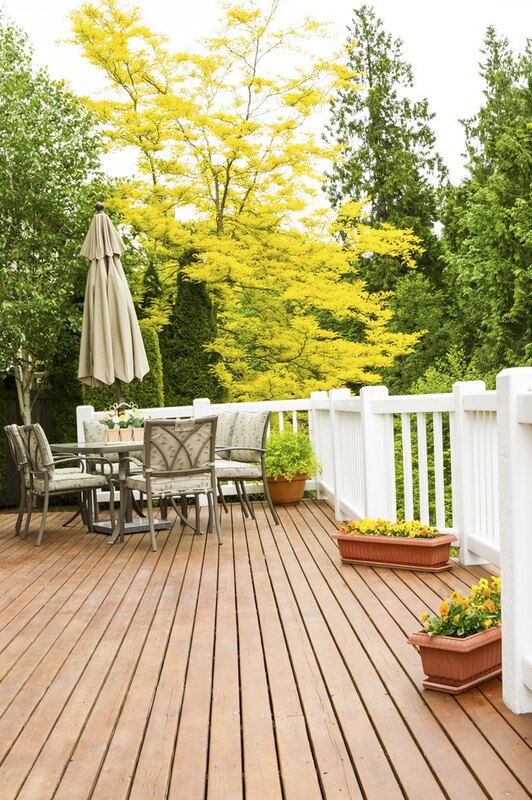 Composite decking is often touted as a maintenance-free alternative to lumber, yet over time its original color will fade, and some individual boards can become stained by spills. Composites aren't designed to be as paintable as natural wood planks, but they can accept paint if the deck is properly cleaned, prepped and primed. 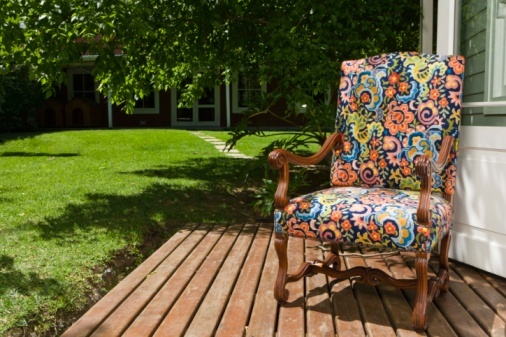 A topcoat of porch paint can then restore beauty to your deck and extend its life for several additional years. You can rejuvenate your backyard deck by painting it with porch paint. Cover any foliage or paved areas with canvas drop cloths or high-quality plastic drop cloths. Mix up a batch of trisodium phosphate in water at the recommended dilution on the product's label. Some communities have outlawed TSP for environmental reasons, but products labeled as TSP alternatives work are comparably effective cleaning products. Rinse off the TSP solution with your garden hose and allow the deck to dry. Sand the decking with a 240-grit sandpaper in the direction of the grain texture in order to gently degloss the plank. Wipe the sanding dust away with a broom or dust brush. Pour some acrylic latex exterior primer into a roller tray. Apply the primer to the decking with a paint roller, moving the roller along the length of the planks. Attaching an extension pole to the roller handle will allow you to paint while standing upright. Clean the roller tray and roller in running water while the primer is drying -- which usually takes one to two hours, or as recommended on the product's label. When the primer has dried, pour the porch paint into the roller tray. Apply the porch paint to the decking with the roller, and allow it to dry completely before adding a second coat. Dry times vary, so read the manufacturer's directions for recommended recoat time.